KnitUK Bamboo and wooden Knitting Needles. Excellent sizes of single point and double point knitting needles and knitting needles set. Order from KnitUK, your online knitting store in UK. KnitUK offers a complete Set of the best Length Bamboo Knitting Needles (10" / 25cm) for Baby clothes and Knitting Acessories in 20 sizes starting at 2.0 mm up to 15 mm at the cheapest price when you order the Set. The size 15 mm is wooden. In here, you also can find Brittany knitting needles that are made in California from sustainbly harvested birch, 14" single point with 5 year guarantee. 10" Bamboo Single Point Knitting Pins in both 12mm and 15 mm sizes can be purchased separately if you do not wish to purchase the complete Bamboo Set. 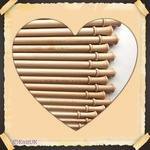 You can also find Brittany wooden crochet hooks in KnitUK Website.